California voted on Tuesday to ban gay marriage, even though they made it legal less than a few months ago. 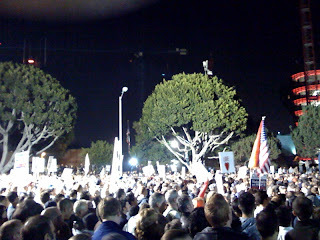 So we went and excersized our right to protest last night and lend our voice to our gay and lesbian buddies. The religious right in America feel they need to force their beliefs on the rest of the world. If you don't believe in gay marriage, don't have one. Don't take away people basic rights.